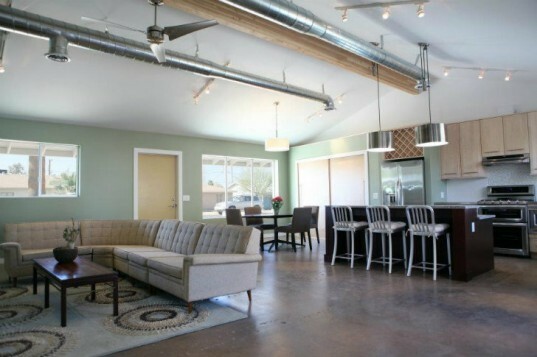 The Castaway House is a stylish renovation of a mid-century ranch home into a highly efficient green home in Phoenix. The renovation was handled by The Ranch Mine, which specializes in the redesign of mid-century homes, adaptive reuse projects and greyfield redevelopment. 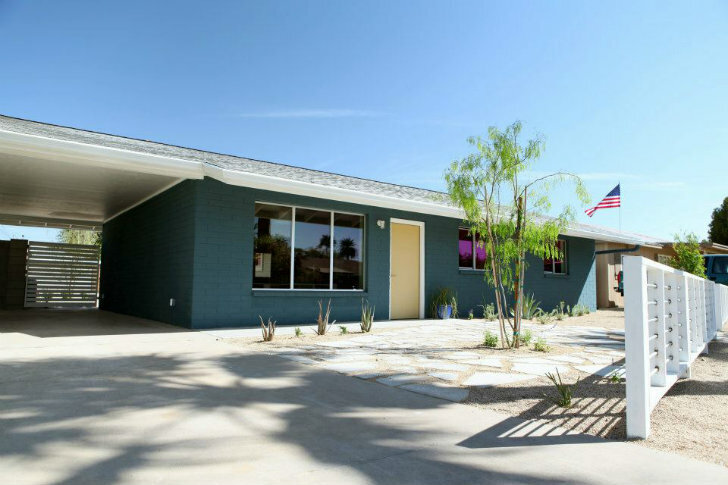 As part of the renovation, the Castaway House now features a tight insulated envelope, energy-efficient appliances and lighting, a backyard addition, water-efficient fixtures and a beautiful desert landscaped yard. In fact, the renovation is so energy-efficient it garnered the award for the first certified project under the Phoenix Green Construction Code. The Castaway House, which was named in reference to the Tom Hanks movie, was originally a 1,000 sq ft mid-century ranch home that was abandoned. The Ranch Mine, which specializes in home renovations, took on the project and decided to transform it into a super-energy-efficient green home. An addition was tacked on to the back end of the house to increase the overall square footage to 1,970, and to add two more bedrooms and another bathroom. The roof was extended to create shade overhangs and upgraded with a vented wall. The envelope was buttoned up, new insulation was added, and new argon filled, dual-pane windows installed. The addition in the back was built with 24″ on center, 2×6 wall framing with prefabricated trusses, heavy insulation, and has been clad with pre-painted aluminum corrugated siding. Inside, energy efficient appliances, HVAC and lighting were installed. Besides energy upgrades, the designers also sought to minimize water use, so they installed two 550-gallon tanks for rainwater collection, a low-volume irrigation system with evapotranspiration control and WaterSense certified fixtures. Eco-friendly finishes, materials and paints were used throughout, and the project was awarded with a Gold certification via the Phoenix Green Construction Code. Even more amazing is that the project was completed on a tight budget of $95 per sq ft. The Castaway House, which was named in reference to the Tom Hanks movie, was originally a 1,000 sq ft mid-century ranch home that was abandoned. The Ranch Mine, which specializes in home renovations, took on the project and decided to transform it into a super energy efficient green home. An addition was tacked on to the back end of the house to increase the overall square footage to 1,970 and add two more bedrooms and another bathroom. The roof was extended to create shady overhangs and upgraded with a vented wall. The envelope was buttoned up, new insulation was added, and new argon filled, dual-pane windows installed. The addition in the back was built with 24" on center, 2x6 wall framing with prefabricated trusses, heavy insulation, and has been clad with pre-painted aluminum corrugated siding. Inside, energy efficient appliances, HVAC and lighting were installed. Besides energy upgrades, the designers also sought to minimize water use, so they installed two 550-gallon tanks for rainwater collection, a low-volume irrigation system with evapotranspiration control and WaterSense certified fixtures. Eco-friendly finishes, materials and paints were used throughout and the project was awarded with a Gold certification via the Phoenix Green Construction Code. Even more amazing is that the project was completed on a tight budget of $95 per sq ft. The Castaway House is the first project to ever complete the Phoenix Green Construction Code. The house received a Gold rating from the program.